As experienced house washers, we’ll take the best care of your home. Before starting, our house washing cleaners will check around your property to ensure that any delicate or at-risk items are secured, moved or covered. We use a variety of house soft washing solutions and the latest equipment to break down cobwebs, mould, grime, grease, rust, calcium and much more. Our machines are adjustable to fit the best temperature for each surface. We know this gets the best results. Our attention to detail and our house washing techniques is what sets us apart from our competition. To give your house an instant face lift contact Pressure and Steam for a free quote. 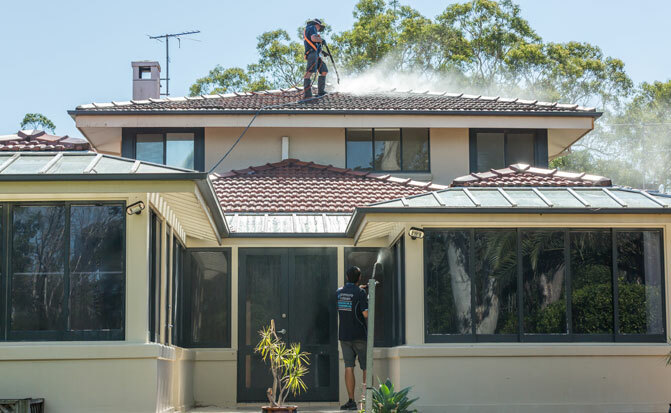 We service the Northern Beaches, Upper and Lower North Shore, Eastern suburbs and the Inner West. Contact us for a free quote. Our house washing experts follow a careful process that will have your home looking its best. Once the correct house washing solution for the surface and type markings has been selected and applied by our expert cleaners, we use a soft bristle brush to agitate and loosen up the more stubborn areas. Then we rinse with low to medium pressure using cold, warm or hot water (the right temperature for each surface). This reduces the need for chemicals and in cases of mould, gives a longer lasting result. Our team is professionally trained and certified in hard surface cleaning. The head technician working on each house washing job has completed vocational training at ITI.